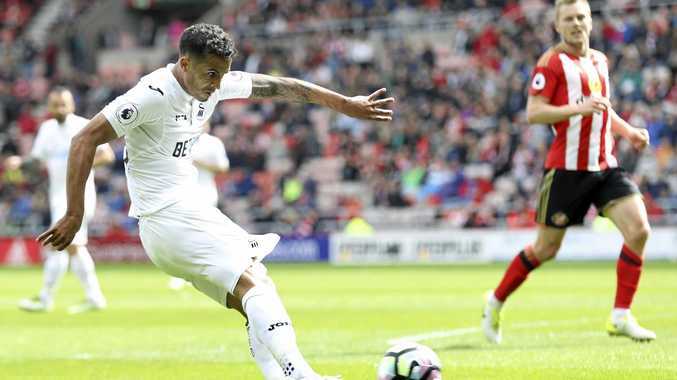 FOOTBALL: Swansea could be celebrating another season in the English Premier League after a 2-0 victory at Sunderland moved the club four points clear of Hull in the last relegation spot. The victory came courtesy of first-half goals by Fernando Llorente and Kyle Naughton against an already-relegated Black Cats team which barely threatened. Hull needed to win at Crystal Palace overnight. Defeat would mean the Tigers join Sunderland and Middlesbrough in being relegated. Even a draw probably won't be enough for Hull ahead of next week's final games of the season because of its inferior goal difference. Swansea's players paid for the tickets of the 3000 away fans for the match and they were rewarded with a third win in four games. At the top, Manchester City enjoyed a huge slice of luck in its quest for a top-four finish, while Arsenal edged to within a point of fourth-placed Liverpool with an impressive victory at Stoke. Leicester City's Riyad Mahrez scored a penalty at the Etihad Stadium but had slipped in his run-up and inadvertently struck the ball twice, once with each foot. Referee Robert Madley correctly applied the law to disallow the goal and City held on to move third. Goals from David Silva and Gabriel Jesus from the penalty spot, secured the victory. Arsenal maintained its late challenge with a classy 4-1 victory at Stoke City to keep the pressure on Liverpool who now sit just one point above the in-from Gunners. Olivier Giroud's double and goals from Alexis Sanchez and Mesut Ozil sealed an emphatic victory for Arsenal who have won five of their past six games. Liverpool played West Ham overnight. Southampton beat Middlesbrough 2-1 with goals by Jay Rodriguez and Nathan Redmond keeping them above Bournemouth who beat Burnley 2-1 thanks to Joshua King's late winner.